BACKGROUND: The impairment of blood flow to the kidney causes renal injury occurs by ischemia/reperfusion (I/R) in surgical procedures, in which the kidneys remain without blood supply for sometime. This is observed during kidney transplantation, vascular surgery of aorta and renal arteries, and in partial nephrectomy. Ghrelin is an orexigenic growth hormone secretagogue of a 28 amino acid peptide derived mainly from ghrelinergic cells in the gastrointestinal tract. It plays an important physiological role in regulating of energy homeostasis and appetite stimulant. In this study, we aimed to assess the ability of ghrelin to exert potential protective effects on the kidney I/R and subsequent kidney dysfunctions in the rat through the modulation of pro-inflammatory cytokines. MATERIALS AND METHODS: A total of 28 rats were used in this experiment and the I/R was induced in a rat model by unilateral renal artery clamping for 30 min and reperfusion for 3 h, and ghrelin (40 μg/kg/rat) or vehicle was injected through intraperitoneal before ischemia and at reperfusion time immediately. Ghrelin administration could exert a protective role in the kidney against injury by significantly reducing serum and tissue levels of pro-inflammatory markers (tumor necrosis factor-alpha, high mobility group box protein 1, and interleukin 1 beta), decreasing the serum levels of (urea and creatinine), and reduction of the severity score of renal damage. CONCLUSIONS: We conclude that ghrelin has renoprotective effects through modulation of inflammation. I/R injury (IRI) is a life-threatening process and a major cause of acute renal failure associated with high mortality and morbidity rates. There are mediators rapidly initiating after direct tissue subjected to hypoxia, namely, tumor necrosis factor-alpha (TNF-α) and interleukin 1 beta that result from ischemia and decrease blood and oxygen supply, ATP production followed by generation of free radicals and later macrophages and T-cells stimulation in response to the time of injury., However, it was found that T-cells is another mediators for renal IRI due to its interaction with renal tubular epithelial cells. As the I/R was a mechanism of multiple organ failures, it could be the leading cause of release of reactive oxygen species (ROS) which initiate progression of cellular damage in the early phase of reperfusion. Despite the well-documented role of ROS in I/R, the employing of antioxidant agents failed to produce a beneficial therapeutic effect, so many strategies are recognized to prevent excessive production of ROS. The elevated levels of ROS have been related with elevated apoptosis in proximal tubuli but not shown in distal tubuli. Ghrelin is a common 28-amino acid peptide with an n-octanoyl modification at serine-3, and this conferred its physiological activity. It created by the ghrelinergic cells in the gastrointestinal tract, and consider as an endogenous ligand for growth hormone, which function as a regulation of appetite and assumes a prominent part in controlling the rate of delivery and utilization of energy. Ghrelin applies wide physiological activities in the body involving anti-inflammatory functions, reproductive system, gastric secretion and gastrointestinal motility, glucose homeostasis, cardiovascular functions, in addition to bone formation. It is released in a variety of tissues such as the kidney, testis, pituitary, duodenum, ileum, jejunum, colon, heart, pancreas, lung, and hypothalamus. Ghrelin has the ability to stimulate propagation of the cells of the intestine and inhibits apoptosis during inflammatory condition in addition to oxidative stress. 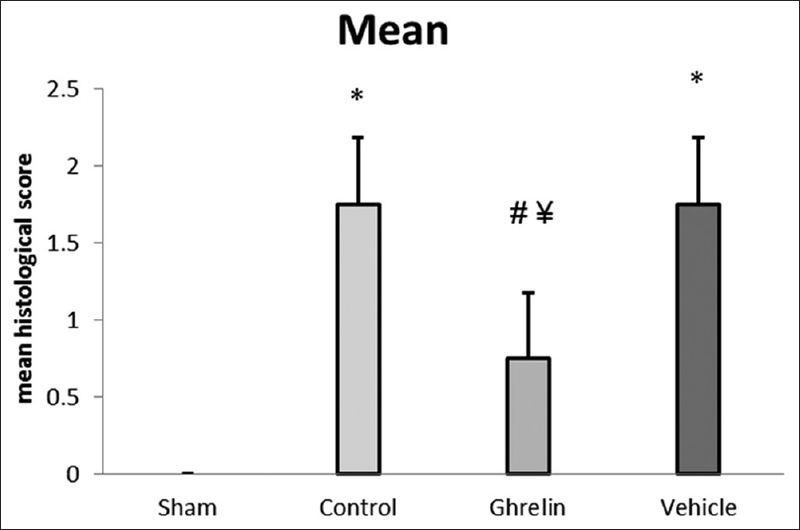 Recent studies show the ability of ghrelin to produce beneficial protective effects in renal I/R in a rat model  injury through vagus nerve, so we have investigated the protective role in renal IRI through modulation of antioxidant and anti-inflammatory effects. 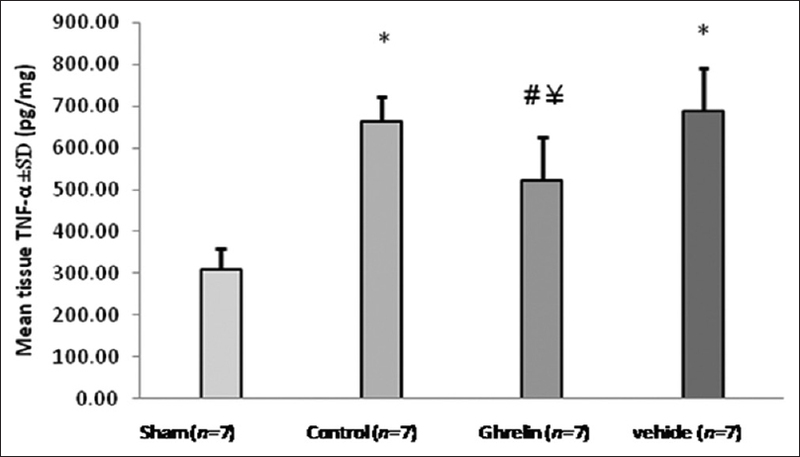 Ghrelin-treated group: Rats pretreated with ghrelin 30 min before ischemia IP (40 μg/kg/rat) and at reperfusion time. The animals returned to their cages and allowed to get better with food and water. In postsurgery after 3 h, the animals are euthanized and both blood as well as tissue samples were collected for analysis. At the end of the experiment, blood was gathered from the heart. The sample of blood was placed in a plane tube at 37°C without anticoagulant and left for 30 min, then it was centrifuged at 3000 rpm for 10 min, and then serum obtained used for the determination of serum TNF-α, IL-1 beta (IL-1 β), high mobility box protein 1 (HMGB1), urea, and creatinine by enzyme-linked immunosorbent assay (ELISA). The kit of ELISA was commercially available according to the manufacturer's instructions. The kidney was washed with normal saline to remove any blood, stored in deep freeze (−80°C), and then homogenization was done by weighing renal tissue (that had been previously stored in the deep freezer) with high-intensity liquid processor in 1:10 (w/v) phosphate-buffered saline and protease inhibitor cocktail. The homogenate was centrifuged at 3000g at 4°C for 20 min. The supernatant was collected for determination of TNF-α, IL-1 β, and HMG-B1 by ELISA with a commercially available ELISA kit (literature of kit) according to the manufacturer's instructions. The tissue sample was fixed in 10% formalin and processed by routine histological methods and embedded in paraffin block. The tissue slide sections were cut about 5-μm thick horizontal and stained with hematoxylin and eosin then sent to histopathologist for subsequent histological examination. After fixation, an investigator who was blinded to the experimental treatment groups performed an evaluation of scores. Tissue sections were examined by light microscopy and graded for degeneration/necrosis. Using quantitative measurements for the assessing scoring system of tissue damage., The damage of tubular identified as swelling of tubular epithelial, brush border losing, vacuolar degeneration, and formation of the cast. The degree of damage in kidney was described through the subsequent criteria 0, represents normal; 1, represents <25% of the damage of tubules; 2, represents 25%–50% of damage of tubules; 3, represents 51%–75% of damage of tubules; and 4, represents 75%–100% of damage of tubules. Data were summarized, analyzed, and presented using two software programs, the Statistical Package for the Social Sciences SPSS version 20 (SPSS Inc., IBM, Chicago, USA) and Microsoft Office Excel 2010. Variables included in the present study were initially described in terms of a number of cases, mean, standard deviation, and range, then they were subjected to two tests of normality distribution Kolmogorov–Smirnov and Shapiro–Wilk tests. Mann–Whitney U-test was used to study the difference in mean rank values between any two groups. Significant level was considered at P ≤ 0.05, whereas highly significant level was regarded at P ≤ 0.01. Blood urea nitrogen (BUN) and serum creatinine (SCr) levels, two important indexes of kidney function, were significantly increased in the saline-treated I/R group after 3 h of reperfusion, while in the ghrelin-treated group, these levels of BUN and SCr were markedly decreased [P< 0.05, [Figure 1]a and [Figure 1]b. In the control group, there are significant (P< 0.05) elevation of serum and tissue levels of TNF-α, IL-1 β, and HMGB1 as compared with sham group. The following figures show these changes [Figure 2], [Figure 3], [Figure 4]. 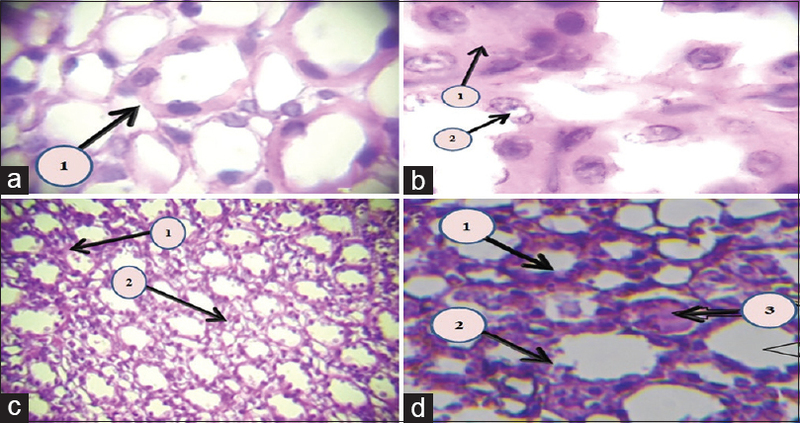 The following photomicrograph sections will show the intersection of different scores after 3 h of renal I/R in [Figure 5] and [Figure 6]. The process of abrupt impairment of blood flow and oxygenation to any organ caused by a disturbance in pro-inflammatory cytokines and ROS due to hypoxia and reperfusion induction are known as IRI. The acute renal injury was the suspected results of renal I/R leading to high morbidity and mortality rates. In facts, renal I/R is an inflammatory mechanism cause elevation of inflammatory cytokines (TNF-α, IL-1 β) as shown by  cellular factors that induced due to hypoxia cause endothelial damage and as well as a tubular injury which is the distinctive character of renal damage. In this study, we show significant (P< 0.05) increase in the serum and tissue levels of cytokines as reported through many studies due to the extreme production of cytokines in renal I/R in a rat model. The importance of pro-inflammatory cytokines released during the pathogenesis of cellular injury (TNF-α, IL-1 β) also reported by Chiao et al. which resulted from the leukocyte infiltration and the explanation of this elevated level of cytokine through I/R is that these indicators are produced from macrophages and monocytes, these results agree with the studies , and I/R lead to infiltration of macrophage to the renal parenchyma., The other potent pro-inflammatory cytokine that contributes to the pathogenesis of diverse inflammatory and infectious disorders, namely, HMGB1 is significantly higher in I/R group (P< 0.05) than in a sham group and this is consistent that reported. HMGB1 stimulate proinflammatory responses through TLR4 as proved by a study. This study shows that using ghrelin (40 μg/kg/rat) 30 min before induction of ischemia and immediately at the reperfusion time caused significant lowering (P< 0.05) in serum levels of TNF-α, IL-1 β, and HMGB1 as compared with that in I/R group. These findings are consistent with other study. The HMGB1 rapidly translocates from its normal site of residence in the nucleus to the cytoplasm and out of cells when stimulation by injury or by damage signaling molecules. The present study shows that the mean of serum and tissue levels of HMGB1 significantly decrease (P< 0.05) in the ghrelin group. This study also agrees with other study in that ghrelin has an anti-inflammatory effect and inhibit HMGB1 as shown by  which proved the inhibitory role of ghrelin through growth hormone receptor (GHR) downregulated receptor. The administration of recombinant HMGB1 to GHR-treated mice abolished the therapeutic effect of the neuropeptide on sepsis. In this study, I/R showed a significant increase (P< 0.05) in serum levels of urea and creatinine when we compared with sham group. These findings agree with most of the evidence that proved the ability of ghrelin to cause a direct effect in reduction of serum levels of urea and creatinine. Rajan et al. showed that administration of human ghrelin as a single dose directly after ischemia (i.e., at the beginning of reperfusion) could protect the kidneys from IRI by attenuating tissue injury indicators (creatinine, BUN). In I/R group, most intersections of renal tissue of rats showed tubular epithelial swelling, loss of brush border, vascular degeneration, necrotic tubules, cast formation, and desquamation. These changes were in agreement with other study  and  also  reported that unilateral renal pedicle clamping for 30 min followed by 24 h of reperfusion in mice would cause renal tissue dysfunction and worse histology after bilateral pedicle clamping with proximal tubular injury, loss of brush-border, proteinaceous casts, interstitial widening, and necrosis and these findings agree with the present study. The severity of histological renal damage is dependent on ischemia time (30 min of unilateral IRI), caused prominent renal damage and severe loss of structure.,,,, The mean severity scores of the sections of the kidney in ghrelin potentiated animals was significantly decreased compared to I/R group (P< 0.05) and that suggest a significant degree of kidney protection from IRI. Waseem T et al. reported that ghrelin protected kidney parenchyma from severe damage in I/R group by lowering the modulating mediators of inflammation, ROS, and inhibited neutrophil infiltration. At the end of this study and from findings that obtained, it can be concluded that ghrelin protects the kidney with significant amelioration of renal IRI as evidenced by preservation of renal histology with normal renal function parameters and significant reduction of markers of renal injury. We conclude that ghrelin has renoprotective effects through modulation of inflammation. Thurman JM. Triggers of inflammation after renal ischemia/reperfusion. Clin Immunol 2007;123:7-13. Ascon M, Ascon DB, Liu M, Cheadle C, Sarkar C, Racusen L, et al. Renal ischemia-reperfusion leads to long term infiltration of activated and effector-memory T lymphocytes. Kidney Int 2009;75:526-35. Ysebaert DK, De Greef KE, Vercauteren SR, Ghielli M, Verpooten GA, Eyskens EJ, et al. Identification and kinetics of leukocytes after severe ischaemia/reperfusion renal injury. Nephrol Dial Transplant 2000;15:1562-74. Kukreja RC, Janin Y. Reperfusion injury: Basic concepts and protection strategies. J Thromb Thrombolysis 1997;4:7-24. Chien CT, Lee PH, Chen CF, Ma MC, Lai MK, Hsu SM, et al. De novo demonstration and co-localization of free-radical production and apoptosis formation in rat kidney subjected to ischemia/reperfusion. J Am Soc Nephrol 2001;12:973-82. Yousif NG, Hadi NR, Hassan AM. Indocyanine green-001 (ICG-001) attenuates wnt/β-catenin-induces myocardial injury following sepsis. J Pharmacol Pharmacother 2017;8:14-20. Sakata I, Sakai T. Ghrelin cells in the gastrointestinal tract. Int J Pept 2010;2010:50-6. Kojima M, Hosoda H, Date Y, Nakazato M, Matsuo H, Kangawa K, et al. Ghrelin is a growth-hormone-releasing acylated peptide from stomach. Nature 1999;402:656-60. Burger KS, Berner LA. A functional neuroimaging review of obesity, appetitive hormones and ingestive behavior. Physiol Behav 2014;136:121-7. Gnanapavan S, Kola B, Bustin SA, Morris DG, McGee P, Fairclough P, et al. The tissue distribution of the mRNA of ghrelin and subtypes of its receptor, GHS-R, in humans. J Clin Endocrinol Metab 2002;87:2988. Waseem T, Duxbury M, Ito H, Ashley SW, Robinson MK. Exogenous ghrelin modulates release of pro-inflammatory and anti-inflammatory cytokines in LPS-stimulated macrophages through distinct signaling pathways. Surgery 2008;143:334-42. Rajan D, Wu R, Shah KG, Jacob A, Coppa GF, Wang P, et al. 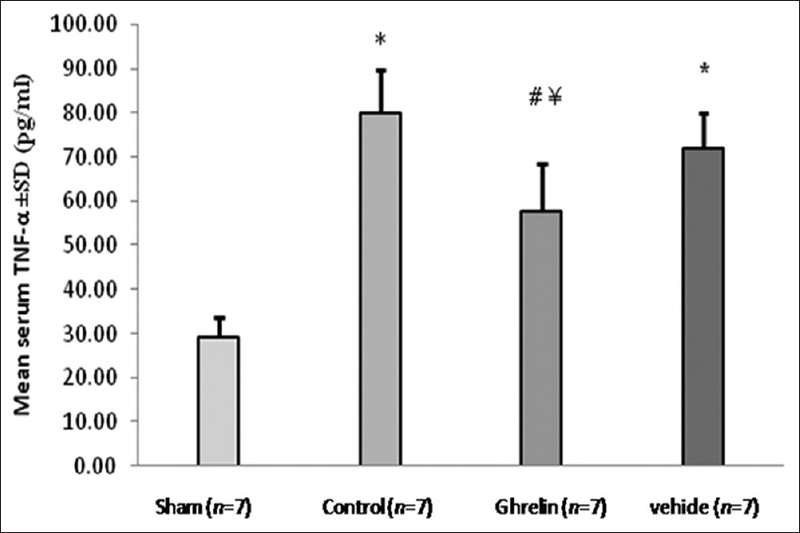 Human ghrelin protects animals from renal ischemia-reperfusion injury through the vagus nerve. Surgery 2012;151:37-47. Can N, Catak O, Turgut B, Demir T, Ilhan N, Kuloglu T, et al. 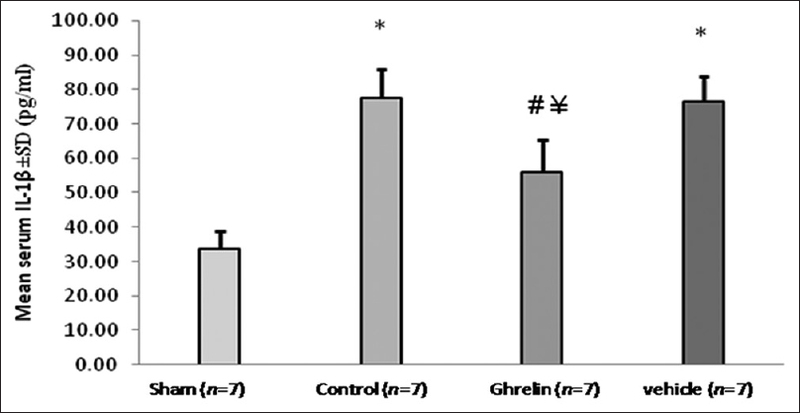 Neuroprotective and antioxidant effects of ghrelin in an experimental glaucoma model. Drug Des Devel Ther 2015;9:2819-29. Matsuyama M, Funao K, Kawahito Y, Sano H, Chargui J, Touraine JL, et al. Study of cysteinyl leukotriene-1 receptor in rat renal ischemia-reperfusion injury. Transplant Proc 2008;40:2149-51. Yousif NG. Fibronectin promotes migration and invasion of ovarian cancer cells through up-regulation of FAK-PI3K/Akt pathway. Cell Biol Int 2014;38:85-91. Rossoni G, Gomaraschi M, Berti F, Sirtori CR, Franceschini G, Calabresi L, et al. Synthetic high-density lipoproteins exert cardioprotective effects in myocardial ischemia/reperfusion injury. J Pharmacol Exp Ther 2004;308:79-84. Chiao H, Kohda Y, McLeroy P, Craig L, Housini I, Star RA, et al. Alpha-melanocyte-stimulating hormone protects against renal injury after ischemia in mice and rats. J Clin Invest 1997;99:1165-72. Miyaji T, Hu X, Yuen PS, Muramatsu Y, Iyer S, Hewitt SM, et al. Ethyl pyruvate decreases sepsis-induced acute renal failure and multiple organ damage in aged mice. Kidney Int 2003;64:1620-31. Liu HB, Meng QH, Huang C, Wang JB, Liu XW. Nephroprotective effects of polydatin against ischemia/Reperfusion injury: A Role for the PI3K/Akt signal pathway. Oxid Med Cell Longev 2015;2015:362158. Popa C, Netea MG, van Riel PL, van der Meer JW, Stalenhoef AF. The role of TNF-alpha in chronic inflammatory conditions, intermediary metabolism, and cardiovascular risk. J Lipid Res 2007;48:751-62. Auron PE, Webb AC, Rosenwasser LJ, Mucci SF, Rich A, Wolff SM, et al. Nucleotide sequence of human monocyte interleukin 1 precursor cDNA. J Immunol 2007;178:5413-7. De Greef KE, Ysebaert DK, Ghielli M, Vercauteren S, Nouwen EJ, Eyskens EJ, et al. Neutrophils and acute ischemia-reperfusion injury. J Nephrol 1998;11:110-22. Takada M, Nadeau KC, Shaw GD, Marquette KA, Tilney NL. The cytokine-adhesion molecule cascade in ischemia/reperfusion injury of the rat kidney. Inhibition by a soluble P-selectin ligand. J Clin Invest 1997;99:2682-90. Chung KY, Park JJ, Kim YS. The Role of High-Mobility Group Box-1 in Renal Ischemia and Reperfusion Injury and the Effect of Ethyl Pyruvate. In Transplantation Proceedings; 2008. Krüger B, Krick S, Dhillon N, Lerner SM, Ames S, Bromberg JS, et al. Donor toll-like receptor 4 contributes to ischemia and reperfusion injury following human kidney transplantation. Proc Natl Acad Sci U S A 2009;106:3390-5. Everett WG, Yousif NG, Ao L, Cleveland LC, Fullerton A, Meng X. Ghrelin reduces myocardial injury following global ischemia and reperfusion via suppression of myocardial inflammatory response. Am J BioMed 2013;1:38-48. Rabadi MM, Ghaly T, Goligorksy MS, Ratliff BB. HMGB1 in renal ischemic injury. Am J Physiol Renal Physiol 2012;303:F873-85. Chorny A, Anderson P, Gonzalez-Rey E, Delgado M. Ghrelin protects against experimental sepsis by inhibiting high-mobility group box 1 release and by killing bacteria. J Immunol 2008;180:8369-77. Yousif NG, Al-Amran FG. Novel toll-like receptor-4 deficiency attenuates trastuzumab (Herceptin) induced cardiac injury in mice. BMC Cardiovasc Disord 2011;11:62. Arfian N, Sari DC, Romi MM, Wibisono DP, Emoto N. Heparanase expression in renal interstitial may contribute to epithelial and endothelial cells injuries after kidney ischemic/reperfusion episode in mice. KnE Life Sci 2015;2:70-7. Ismail OZ, Zhang X, Wei J, Haig A, Denker BM, Suri RS, et al. Kidney injury molecule-1 protects against gα12 activation and tissue damage in renal ischemia-reperfusion injury. Am J Pathol 2015;185:1207-15. Slimani H, Zhai Y, Yousif NG, Ao L, Zeng Q, Fullerton DA, et al. Enhanced monocyte chemoattractant protein-1 production in aging mice exaggerates cardiac depression during endotoxemia. Crit Care 2014;18:527. Le Clef N, Verhulst A, D'Haese PC, Vervaet BA. Unilateral renal ischemia-reperfusion as a robust model for acute to chronic kidney injury in mice. PLoS One 2016;11:e0152153.